This article was published by Al Jazeera. 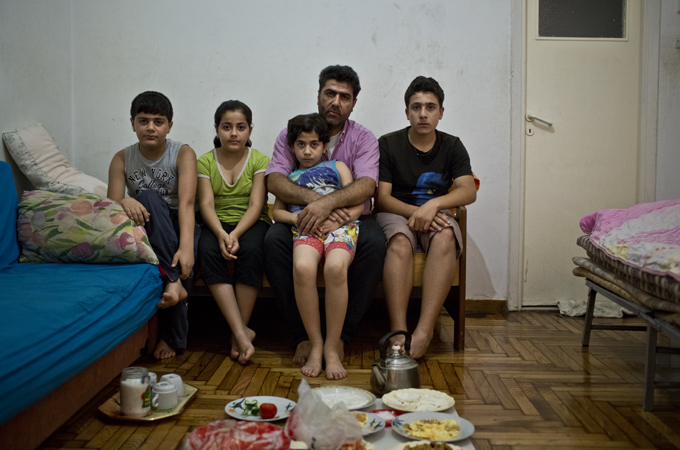 The passage to Greece was probably easier for Daoud Abdo and his family than it is for most Syrian refugees. It took the family of five just two weeks to travel by bus to Istanbul and cross the Evros river, which forms Europe’s southeastern-most land border; but it was still fraught with danger. That was only the beginning of the family’s ordeal. Once in Athens, they spent a full year sleeping in city parks and on the street, only intermittently offered shelter by the traffickers to whose Syrian collaborators they had paid 18,000 euros to take them to Western Europe. Sometimes the shelter was offered on condition that they prostitute their eldest daughter, Suzin, a poised girl with intelligent eyes and a coy smile, who was then 14 – an offer they never accepted. It was only here that they discovered that the full bargain they had struck in Aleppo would not be honoured without more money, and that, penniless and jobless, they were stranded in Greece. Abdo says his properties are mostly destroyed by the war in Syria and he would never risk going back. “There is no peaceful place left in Syria. Because we are Alevi people hate us,” he says referring to the minority tribe that, since Bashar al Assad’s father became president in 1971, has held sway over this nation of 22 million. “Before the hate was hidden. Now there is constant pressure from all the villages to leave.” His wife’s family has scattered to other countries. “I will not send my children to their death,” she says when asked if the family would ever return to Syria. 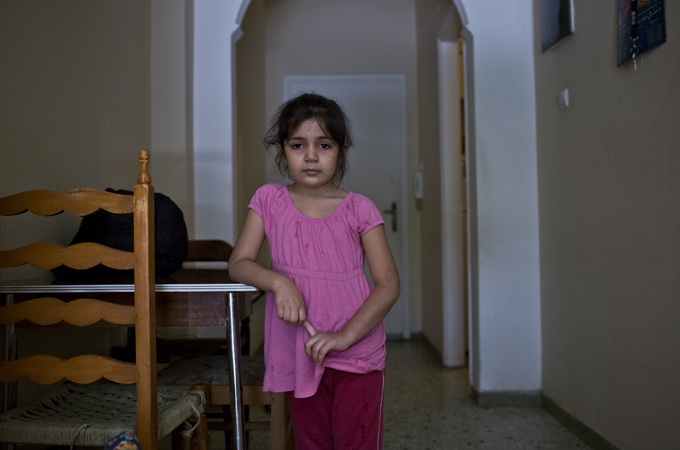 Six months ago they were picked up off the street by scouts for the Coptic Church in Greece and were put up in an apartment owned by the church, which also feeds them on a daily basis. Yet life in Greece remains difficult. 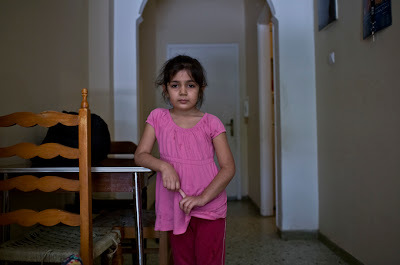 While the war rages, Greek authorities will not deport Syrian refugees, but nor will they support them in any way. Without residence permits, it is next to impossible for them to work legally. Many are reduced to begging. Others live off the charity of the Greek Orthodox church and community organisations. It is easy to be picked up during police stop-and-search operations targeting undocumented migrants. Syrians can end up jailed for months while their nationality is verified, and once inside a detention centre, police brutality is all too frequent, as Juan Akash, a 35 year-old journalist, discovered. Akash was taken to Korinth detention centre, one of six police have created to house deportation subjects. “It is not a human place,” Akash says of the former army camp where he spent close to 50 days before being released. Greece has suffered a severe backlash against migrants, legal and illegal, as a six-year recession has driven unemployment to 27 percent. Coupled with this, Greece has over the past two decades become Europe’s frontline immigration state. According to Francois Crepeau, the United Nations’ Special Rapporteur for the Human Rights of Migrants, 85-90 percent of “irregular migration” into Europe passes through Greece. The UN often decries conditions in these detention centres. Crepeau called them “shocking” and the detention of children and families “utterly unacceptable”. The financial burden of policing external European borders and the legal task of separating political refugees and legitimate asylum seekers from economic migrants has come as a shock to Greek authorities, which estimate the total cost at some $650 million a year – an enormous sum in light of the fact that Greece can barely pay pensions or finance public hospitals. “The European contribution is 230 million euros. We are grateful, but… I am afraid that it is not enough,” Greece’s public order minister, Nikos Dendias, told European officials last month. The war in Syria has exacerbated the problem enormously because it has produced close to two million refugees in just a year. Thousands have elected to go to Europe, but end up living a non-life in Greece, which hasn’t the money, and arguably the legal culture, to support them. The Hiluh family are a case in point. They applied for political asylum, a notoriously difficult process in Greece, where applicants must pass muster through two committees. Until now, the process taken up to three years. “Average approval rates are 0.25 percent in the first committee and about nine percent in the second committee,” according to human rights lawyer Alexandros Konstantinou. This is progress, but the Asylum Service won’t be processing the backlog of at least 25,000 valid applications that are still languishing. Those will remain in the hands of the police. To make the point, they began to knife the dinghy one compartment at a time, until the Hiluhs and their four children, including an infant, were in the water. “Only then did the coastguard pick us up,” says Hiluh. Like the Abdo family and thousands of others, they are stuck in Greece without the money to go deeper into Europe or the legal means to feed themselves. Greek asylum procedures have become so notorious, that a European Court of Human Rights ruling obliges other EU member states to process those who manage to escape Greece and file applications on their soil – even though this directly contravenes existing treaties. what a moving and troubling story. It puts some of the Greek problems into perspective.